For the last two weeks we (Chris and I) have been moored outside our local pub the "Shady Oak". The reason....it has been closed since October and our good friends Pete and Yvonne have taken on the pub as landlords. Pete and Yvonne are boaters themselves and have run pubs in the past so the "Shady" will be in good hands. Unfortunately the previous landlords have rather neglected the pub so we have spent the last weeks clearing up rubbish outside and decorating inside. All being well the "Shady" will re-open on the 10th April. If you are heading towards Chester please drop in for a drink and say hi. Last weekend was the warmest on record and not to miss out we decided to have a Bar-b-q at the Shady Oak. Whilst closed, the pub grounds made for an ideal site to hold a mass Barbi. It felt soooooo good to be out on the cut again. We cruised the 45 minutes to the pub and moored jup Tattenhall side of the bridge. All afternoon other boats from the marina moored up with the crews having the same idea. At one point over 14 boats moored up, more than ever seen at one time in the past outside the Shady. Had the pub been open I reckon we'd have drunk them dry. Chris and Smudge lapping up the sun. The afternoon sun was as warm as a summer's day so we enjoyed a sit out on the towpath all afternoon. Life felt good again. more boats, some even doubled up. At 5 pm the Barbi's were fired up and a good feast was had. A pleasant evening was had by all. It was clear everyone enjoyed the night but in the morning all mucked in to clear up. On Sunday we got up and the gang enjoyed some bacon and sausage baps. We then took a walk up to nearby Warton's Lock to see how the works were progressing. The new gates were in and beams ready to be installed. Much of the brickwork was being repointed. We packed up and left at 4pm to return to the marina. Just a quick blog to thank all our readers and to wish you all a very happy and prosperous New Year. May 2019 make all your dreams come true. Happy Cruizin one and all. May there be plenty water under the base plate and your props stay rubbish free. 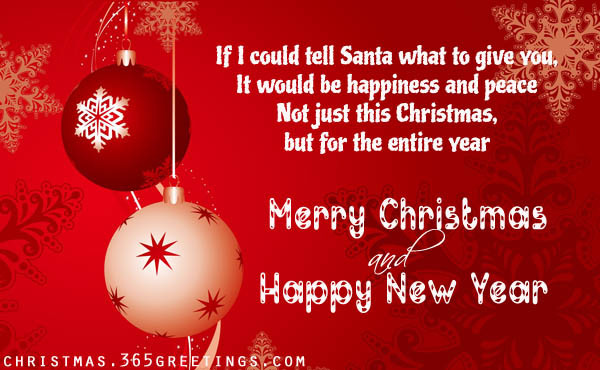 Merry Christmas to everyone. Hope you are enjoying the holiday and not over indulging too much :-). Chris's last working day was the 14th December and a Works Christmas dinner was arrange for 2:30pm at the Cheshire Cat pub. Whilst Chris was at work I fettled AmyJo for cruising and left the marina by 10am. I managed to moor right outside the Cheshire Cat at 1pm. After walking smudge, I left him at home and went to the pub for a pint. Whilst there I was invited to join in the feastivities with all Chris's work mates which made for a pleasant afternoon. Once the meal was over (I abstained by the way) some of Chris's colleagues came back to the boat for a few more drinks and good banter was had by all. In no time at all 3 bottles of wine had mysteriously evaporated! On Sunday we returned to the Marina and the following day drove to Essex for a few days to visit family to give them the Christmas prezzies. Traffic was surprisingly good with the only hold ups around roadworks on the M25. Its always good to catch up with everyone back South but we're glad to get back home again. 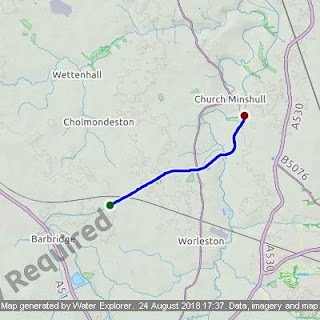 Friday 21st saw us back on AmyJo and again heading to Chester. This time we wanted to get into Chester before stopping. 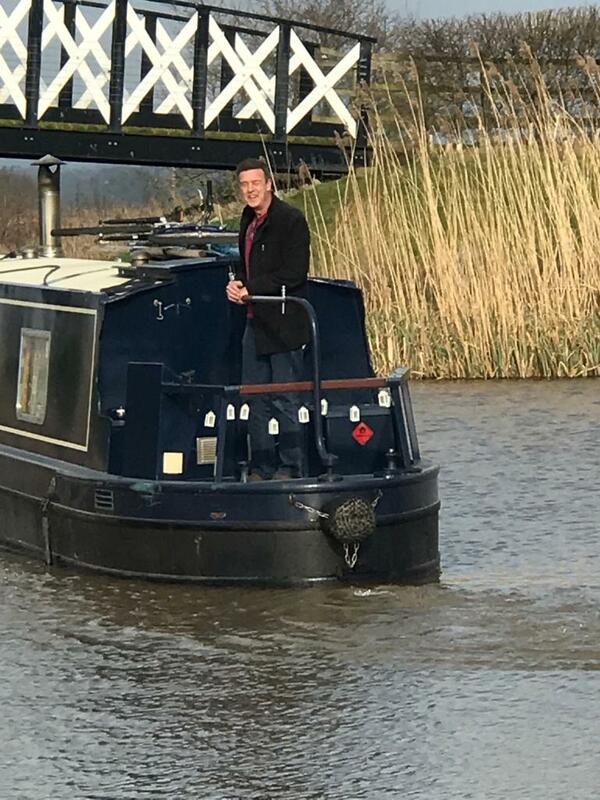 Chris needed to do a food shop so we moored outside Waitrose for a while and then moved onto the first mooring bollards just before the Artichoke bar. Its quieter here and far enough way form Harkers pub to avoid the shouting and drunken antics. Next morning Chris took herself off into town Christmas shopping while I moored AmyJo further along the cut. We managed to moor 3 boats back from the Lock keeper pub and had a pleasant night there. Glad to report on Chris's return the bank manager is still talking to me. 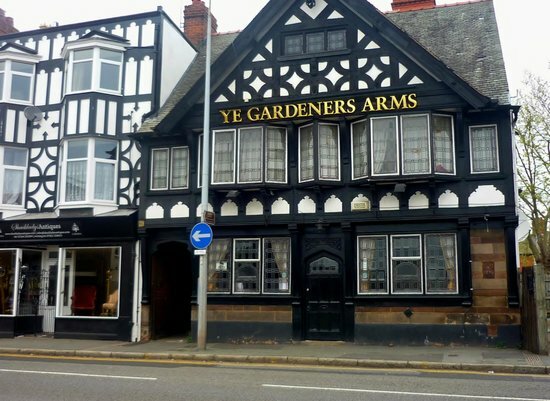 Every other Friday in Ye Old Gardeners Arms is Karaoke night. Pete and Yvonne, good boater friends of ours, have just taken on the pub as landlords so we go there to support them. Pete likes me to have a go at the Karaoke and with a Christmas theme we both dueted a Bing Crosby and David Bowie number, Peace on earth. It was so popular we ended up singing it again later after numerous request for us to do so. Of course being a boater run pub Friday nights would not be the same without our good friends from the marina coming in too! 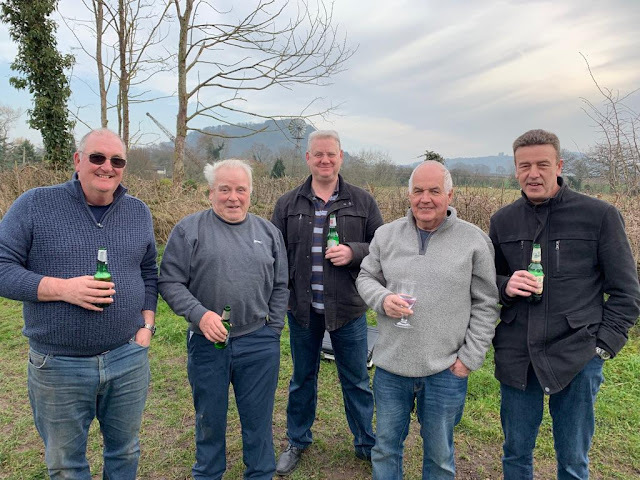 These are the same people we cruised the Llangollen with this year and always come to support the pub as well. Pete and Yvonne are 2nd and 3rd on the left. On Sunday we headed off to the basin, descending the infamous Northgate locks. I say infamous because of the number of boaters that do not like or will not use them. I know I mentioned this before but whilst deep, these are the gentlest of the double locks on the Shroppy. We always enjoy going through these locks. Even the pigeons are still here riding the gates as they have done for the last 4 years. We found the basin pretty full with most mooring spaces taken and wondered if we would be able to stop. We did find a spot just after the turn bridge opposite Taylors boat yard right next to the CRT fascilities. Bonus though very shaded by the surrounding tall buildings. A few days later a boat moved off the visitors mooring nearest to the water tap so we moved AmyJo over into their spot, double bonus. We have been here since then. It more open here and enabled us to take better advantage of the little sunshine we have had to use our new solar panels. Glad to say we're getting 1.5 amps even on a dull day. Christmas Eve dawned grey and foggy. Despite being the festive season the day felt dowdy. We rose late again and pottered about for the rest of the day not really doing much. When spending Christmas Eve in Chester we always like to attend the midnight mass in the Cathedral, it always has a special feel to it and for us is the start of Christmas proper. The city was alive with people and looked great with the lights and Xmas tree outside the town hall. Inside the Cathedral people gathered and we found a seat near the bronze nativity scene. The service started at 11pm and finished just after midnight. We always enjoy this service after which we returned to AmyJo for a night cap and bed. Today, Boxing Day, we took Smudge for a walk round the city walls and stopped for a drink at the Abode. We were out nearly all day and tonight I took Smudge out for his evening walk in thick fog. The basin shrouded in fog and looking like a scene from a movie. I was waiting for the spy to appear but no sign of him. My glad as I forgot the secret phrase anyway. So there you are all updated. 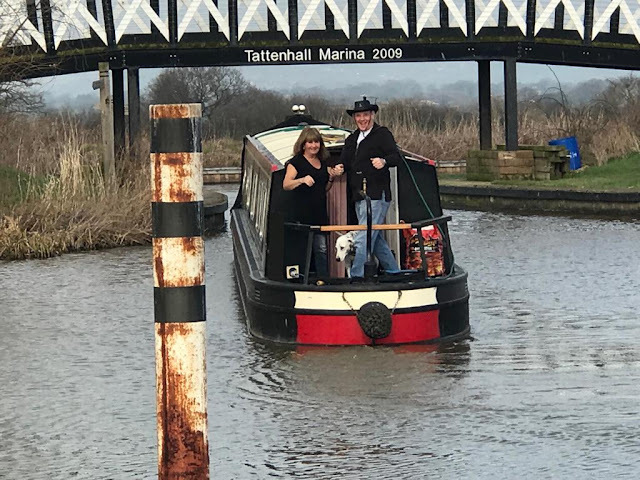 We'll be stopping a while in Chester before returning to Tattenhall so Chris and I would like to wish you a wonderful New Year and may all your dreams come true in 2019. As you may have guessed already the blog has not been updated for some time. Mainly because I wanted to have a break from it for a bit but also because we have settled back into marina life for the winter. It is, however, quite humbling when people come up and ask when am I going to post the next installment of the blog. Whilst I knew people took time to read my missives here I have greatly underestimated just how much the blog is enjoyed by many. So, after many requests to get on with it here we are. 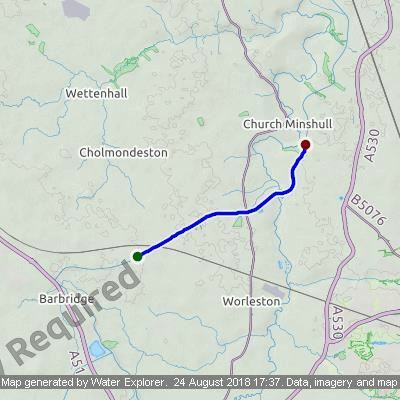 As you may recall our previous post had us spending a few days up the deserted Middlewich branch, which from the Shropshire union still has 8 navigable miles. Our return from there had us moored up for a week below Iron lock by Chas Harden boats. The weather was becoming changeable but still pleasant so I took the opportunity to start to prepare for the coming winter by giving AmyJo a good polishing. This year I used different polish recommended to me by the late Andy Munro of Fernwood boats. I say late as we heard the sad news that Andy had passed away suddenly. Such a shame and a good man who will be greatly missed. Alas, as a result, Fernwood boats are no longer trading but their legacy lives on in the boats they built like AmyJo. Anyhoo, to clean off the marks I used Farecla G3 colour restorer sold in Halfords. This is a clay based product and does not remove paint unlike T-cut, but does remove scuffs and grime whilst restoring colour. The result was amazing with the resultant colour and shine showing up how tired AmyJo's paintwork had actually become. After that, a going over with Farecla G3 Super Wax brought the paintwork back to its original mirror glaze. The big difference with this polish seems to be the shine appears to have lasted much longer and is still bright today as I type. The rain beading and running off easily. The lady driver escaped unharmed and fortunately no livestock was aboard when it happened. I was told she had done this run many times before but this time had to apply brakes because of a slow car ahead of her. This caused the unit to dip and the front of the trailer to rise causing it to catch the parapet jamming the truck in the process. So jammed was the truck it took two heavy recovery trucks to pull it out. The road was then opened, one lane only, whilst the bridge was inspected and damage to the road repaired. September was upon us and we had booked AmyJo into Tattenhall for her haul out and blacking. When she came out we were disappointed as the blacking was once more virtually gone and bare steel was left. I've had it with using Keel black and will never use it again, instead, this time we have gone with tried and trusted Intertuf 16 Bitumen blacking. This is what most boats are painted with and is a proven blacking so we'll see how this fares. This year we had a willing helper in the form of our eldest daughter, Amy, who spent the day applying blacking after the hull had been prepared. The weather was kind to us this year so a good job done and out of the way. I do so hate this part of boating. Amy getting stuck in. She's a good worker and we were grateful for her help. 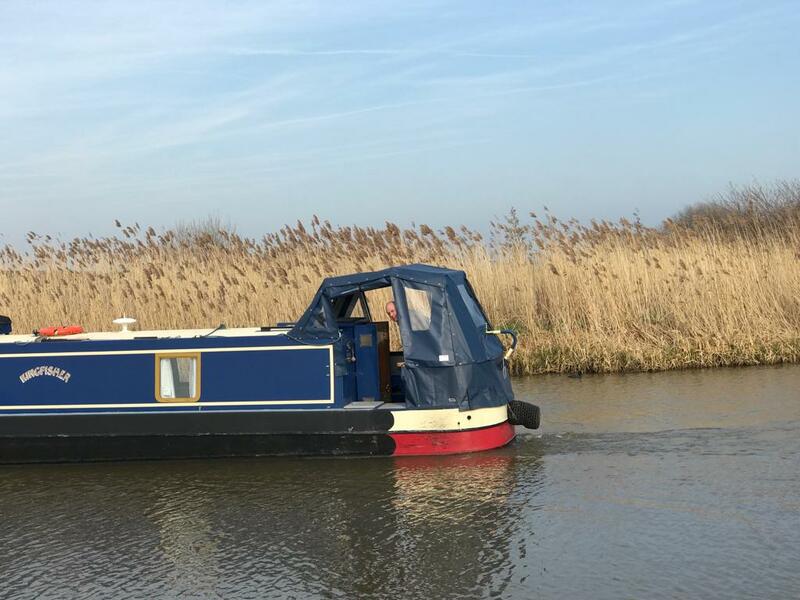 When AmyJo was relaunched we spent a few more weeks around the area between the marina and Chester, moored up in various moorings and Chris commuting to work. I moved AmyJo on Mondays to a new location to keep C&RT happy and not overstay. 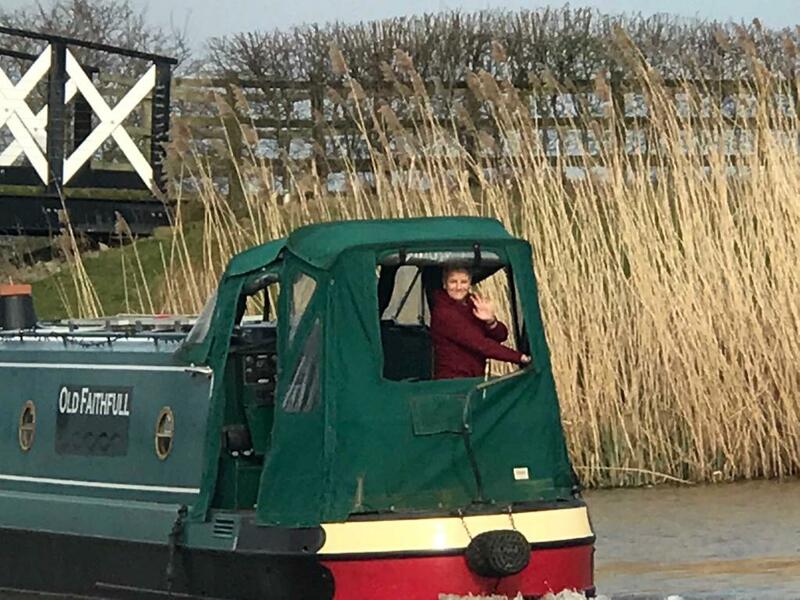 The cut here has been very quiet this year due to the Breach at Middlewich so our favourite mooring spots have always been free when we got to them. Red sky in morning Sheppard's warning Winter cometh. 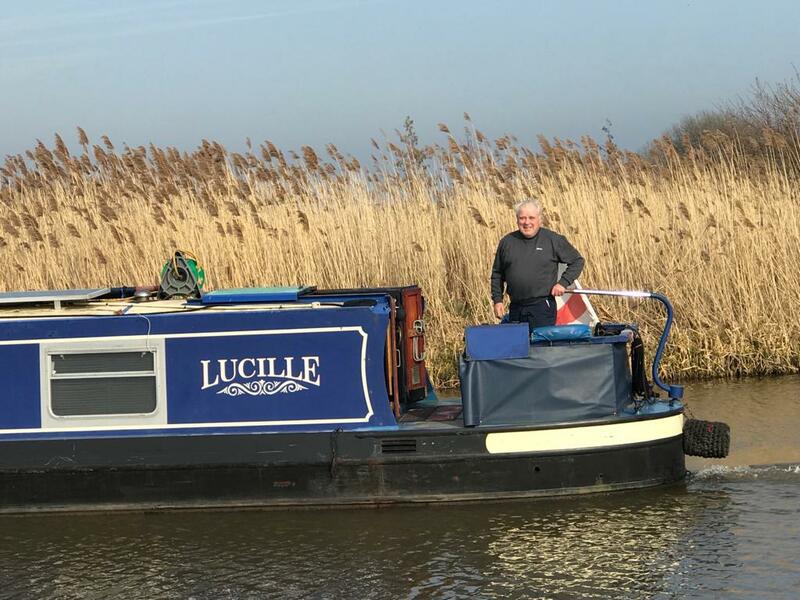 With the shorter darker days we were running the engine more to keep the batteries topped up so mid October we decided to go back to the marina for the winter. Such a shame as we have had a fantastic summer this year but, whilst Chris works, marina life in the winter best suits us. Running the engine more as winter approaches is normal as the drop in solar power occurs as the sun gets lower in the sky but, I was beginning to worry about the lack of power being generated by our panels. It was way lower than usual. It was not until storm Hannah reached us that we found out why. I had not want to go with solid panels as I considered them unsightly but this experience with semi flexible ones has forced the issue. After a phone call to Onboard Solar, Tim was on site in November to fit 4 x 165W solid solar panels. As we have a 24V system this will give us 330W of solar power, 130W more than before. Even on a dull cloudy day these panels put out 2 amps of power at this time of year. I look forward to see what they produce in summer. The new Solar panels don't look as unsightly as I thought they might. Tim usually likes to mount the panels in the center of the roof but because of our boarding plank and pole rack he had to offset two to one side. Whilst this is not as neat as he liked it still does not look too out of place and does still leave walking space on the roof. I have to admit they don't look too unsightly and I actually like the way they have been installed. With time on my hands now I have turned to my many planned winter jobs. One of which was to increase storage space in the galley. To do this I am adding some plinth drawers to available voids under the kitchin units. I reckon we can fit 4 drawers using B&Q drawer packs and using the original plinth as drawer fronts. With these installed there is enough height in a draw to stand a standard sized tin of beans upright and more importantly room to lay 12 bottles of wine! I managed to find some nice handles to put on the draws that will not catch your legs as they do not stick out very far. I'm quite pleased with the result and, there is still enough free space to allow air circulation to stop condensation forming behind them. First of the plinth drawers installed just the iron on edging required. One of the small handles, gives enough grip to open the drawer but small enough not to catch your toes on. So that's where we are up to so far. We are planning a couple of small trips out before the end of the year but I'll save these for another post, at least they will give me something to bore you with. As expected, we have found the Middlewich Branch extremely quite. We made our way to Cholmondeston lock by Venetian Marina and found a nice mooring just above the lock for the night. We passed only one boat moving and one moored up in front of us later on for the night. There was a small group of boats here and a group Bar-b-q was taking place on the towpath. Later this was curtailed as a heavy downpour put an end to sitting out on the path. This morning the sun was out but large grey clouds were beginning to appear. As there is a water tap close by Chris took the opportunity to get a wash load done to keep on top of the laundry before we set off. When this was completed we moved AmyJo the few yards to the water point and filled up. C&RT appear to be re-laying the stonework around the gate on the off side of the lock and their fencing made it difficult to get to the paddle to work it but there was just enough room to squeeze in. Just as we were full and left the water point a boat came up and out of the lock so we went straight in, for some reason, keenly watched by a group from the towpath. This was the first moving boat we'd seen since joining the branch, The group watch in the background from the towpath. We left the lock and chugged slowly past the marina and under the railway bridge. So quiet is the branch that these were the only two boats moored up on this popular stretch. No queue for the lock and not a moving boat for miles. We arrived at Minshull Lock to find it also in our favour. Obviously no one had used the lock since we passed the boat at Cholmondeston lock. The cottage here looked as though it has had some TLC as it looked splendid with its tended garden. Straight into and down the lock on our own. It was a nice cruise with the cut all to ourselves. You can see the black clouds accumulating in the photo too. We expected traffic as we passed Aqueduct Marina but here the moorings were also empty. We finally reached Church Minshull moorings to find we had them completely to ourselves. By now a very big ominous black cloud was approaching across the valley and just as we finished tying the lines the heavens opened up. We sat out the shower banging on the shelf until it finally eased so I could deploy our anti shelf tires to hold us off. The sun later made a brief appearance but showers have scudded through all afternoon. The temperature has notably dropped somewhat and for the first time this summer I've put on a jumper! One of the most popular moorings on the branch and we are Billy no mates. A rare moment with the sun out. Its now 6pm as I type and so far only two boats had gone past since we moored up. Its so peaceful its heaven here at the moment!